How does a KFTC member get in the spirit for I Love Mountains Day? In Berea, a contra dance and a pie auction can do the trick. 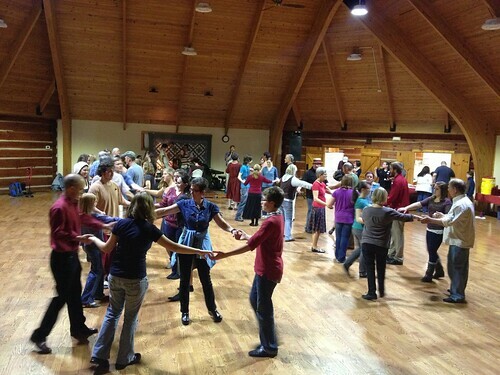 On Friday the Madison County chapter partnered with the Oh Contraire contra dancers to host a dance and pie auction to raise awareness about mountaintop removal coal mining and to raise money, but most of all to give Bereans a chance to have fun on the dance floor. Around sixty chapter members, Berea residents and college students gathered at Berea’s Russell Acton Folk Center to dance and to write valentines to Governor Beshear, caller Joe Wilkie leading the dancers through a variety of traditional dances throughout the night. Madison County Representative Rita Smart visited the Madison County Chapter at its November chapter meeting this Monday to discuss her work at in Frankfort during the last year. 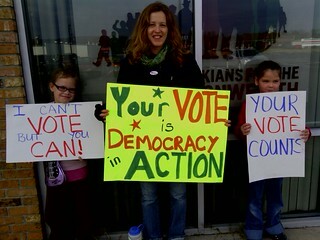 Rep.
Madison County KFTC members young and otherwise have been hard at work getting voters to the polls. 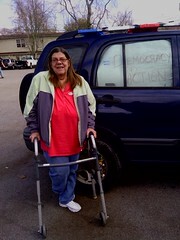 Our "Just Voted" car is catching attention around Richmond and Berea. Members, including 8 year olds Madison and McKayla, are passing out voter guides and waving signs at local businesses. We've been calling Berea College students to get them on shuttles that the college Student Government Association is running. And we made a few shuttle trips ourselves. We still have a few two and a half hours to get everyone to the polls, so we're going to do everything we can to get them there! Madison County has been at it again! 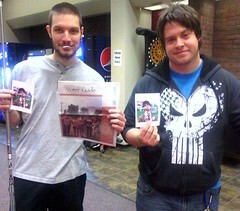 On Halloween, members pounded the pavement on EKU's campus, handing out "Zombie" election reminders and voter guides. Many students are excited to be voting in their first Presidential Election and promised to get to the polls next Tuesday. On Thursday night members met at the Berea office to eat a pasta dinner (with homemade sauce - YUM!) and snack on leftover Halloween candy. We made over a hundred phone calls to voters who registered at our tabling events, and got positive responses. Several voters appreciated that we could look up their polling place online, and many are planning to look up their ballot ahead of time by using the link on www.KentuckyElection.org.